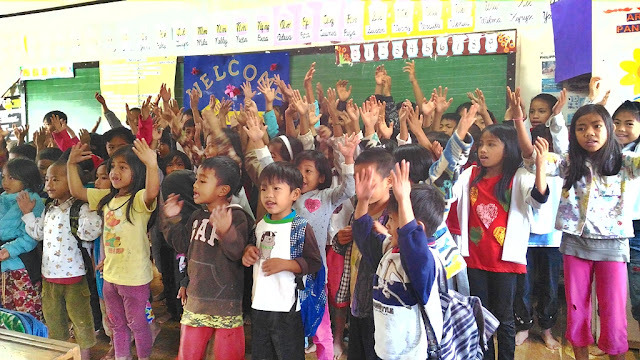 “Happiness and kindness is something if you give it away—then it comes right back to you,” the song reverberates harmoniously inside the classroom as the pupils of Ogo-og Elementary school sing in unison. A few minutes more and we will be distributing the school-supply kits to each one of them. Everywhere, the wide smiles are in display as the little ones happily goofed around with each other, unable to contain their excitement. We arrived at this highland town the previous night—after almost 24 hours of land trip prolonged by a few misadventures on the road; suffering a flat tire, getting delayed by a landslide and getting stuck in a deep mud on a long stretch of rough road heading to Kaleo, Barlig, Mountain Province. Rice terraces sprawled widely en route to Ogo-og Elementary School. As I looked back to that exact moment when the kids concluded their song and we started to hand out their school supplies, I felt the kindness they were pertaining to in their song, the one the comes back—is what we are receiving from the community and the realization of seeing how they live their daily lives. Close knit and planted in simplicity, fueled by backbreaking farming jobs in a setting surrounded by a beautiful set of nature, the townsfolk’s of Kaleo and Ogo-og has definitely not only shown to us what a peaceful and loving community they have, they also handed back to us what we came to bring. 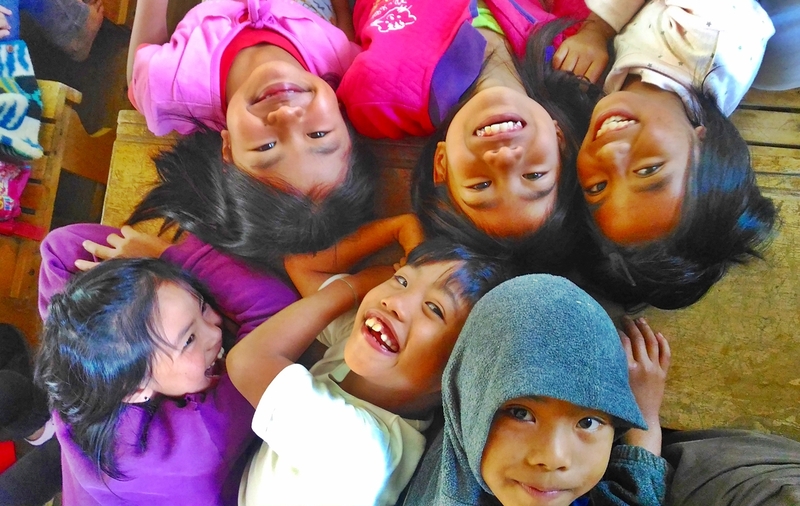 In a place wrapped by stunning visuals of snaking rice terraces and rolling hills, and beyond the fog-covered foot trails, kindness certainly comes full circle in this part of Luzon. As the sprinkle of raindrops and a thickening fog starts to envelop our surrounding, we stood by the side on the road—or what looks like endless path of mud, fallen trees and skidded rocks—and watched as a number of men try to pull our jeepney that got stuck in a deep sludge rendering our vehicle immovable, to no success. Kid s endure difficult trails and weather just to attend school. “This is what we always encounter on our way to my hometown,” Jeric told me in Tagalog. “I hope by the month of April, the whole road will be cemented, so it would be easier for everyone to reach our place.” Jeric is a young teenager who hails from Ogo-og, the town of our destination, who is now based in Baguio City, after he became an Internet sensation after a highland tourist took his photo while he was filling up and carrying sacks of carrots. That photograph became viral, and earned him the moniker the “Carrot Man”. While he seem to avoid any questions about his foray into the world of show business, he tells us that he went straight from Baguio City after he learned that a group of travelers will be visiting his home town to bring box loads of school supplies. 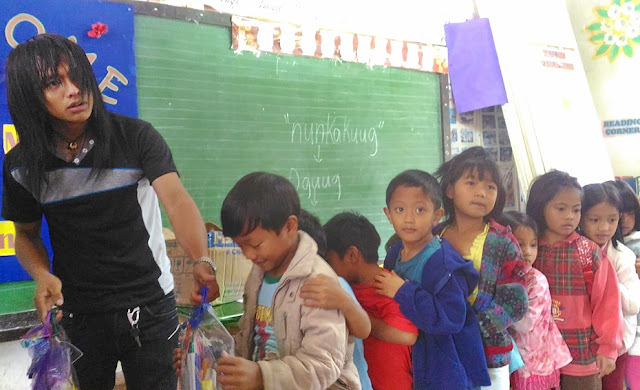 “It is nice for all of you to come a long way and share school supplies to the school I attended,” Jeric tells us. 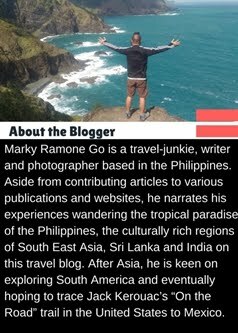 I came as part of a group of travelers organized by Ann Marie Cunanan, the founder of Meaningful Travels PH. As an avid traveler, even way back when she was still in the corporate world, Cunanan decided to take her travels on another level—in terms of accomplishing the dual goals of satisfying one’s wanderlust and also to form a genuine relationships with the communities she visits. 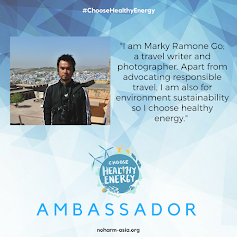 “I remember talking to a dear friend when we were conceptualizing about travels that make an impact. She mentioned that when people travel, they take a lot with them; memories, photos, souvenirs and anything in between. But what if we take our travels a notch higher? What if we also give back to the places that we go to?” Cunanan recalls. “So I realized, what if you take the time to say ‘hello’ to the very people who lives in the places you visit, sit down, share a meal with them and listen to their stories at some points in your travel. In short, you connect and build relationships,” Cunanan adds. When the 10 of us hopped inside the Banaue-bound bus at the Ohayami bus terminal in Sampaloc, Manila, we were strangers to each other. 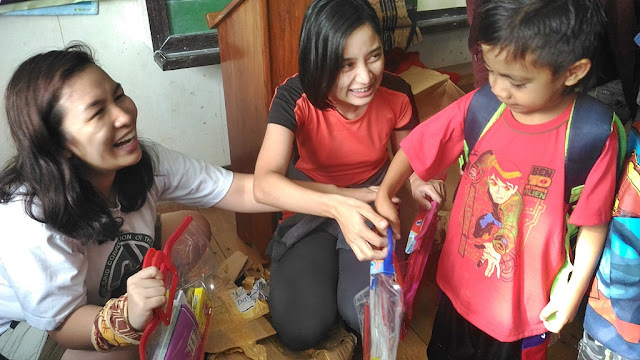 Along with us were boxes filled with school supplies donated by dozens of random individuals, who heeded the call of Meaningful Travels PH to help raise funds for the students of Kaleo and Ogo-og elementary schools. Jeric , a.k.a. Carrot Man, helps in distributing the school-supply kits. On the 11th hour of our trip after our brief stopover in Banaue, we were all laughing together on top the jeepney, top-load style, as it threads the snaking road of Mountain Province. It will take us another eight or nine hours of traveling together, and by the time we reached the town of Kaleo, we’ve become not only Facebook friends, but real-life friends, as well. Almost to the day of the minute we left Manila, and another hour of trekking under darkness and a heavy downpour, we finally reached the school of Kaleo. 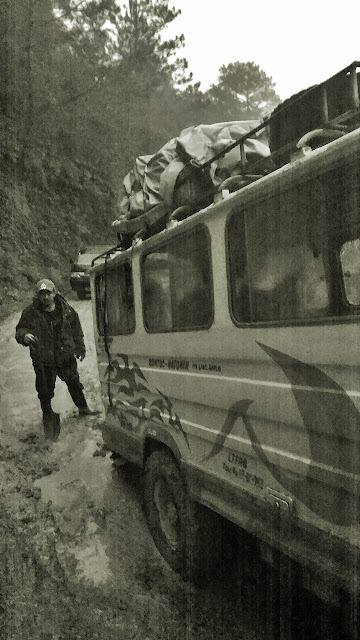 Despite the challenging travel, the whole experience taught me to just shrug off whatever commuting inconvenience we had that day, realizing that these kind of unfortunate instances are everyday occurrences for the locals living in the remote villages of Ifugao and Mountain Province. Where the towns, schools and markets are separated by mountains and long stretches of dirt road—traveling to and from one place to another do takes to another level of difficult. “Our students were here waiting until 5 p.m. and excited to meet all of you,” the school principal of Kaleo Elementary School told us. Since we arrived deep in the night, the children has gone home and, instead, left “thank you” notes with happy faces and words of gratitude. After sharing stories and simple introductions over a sumptuous hot dinner and soya coffee, we all surrendered to sleep that night. 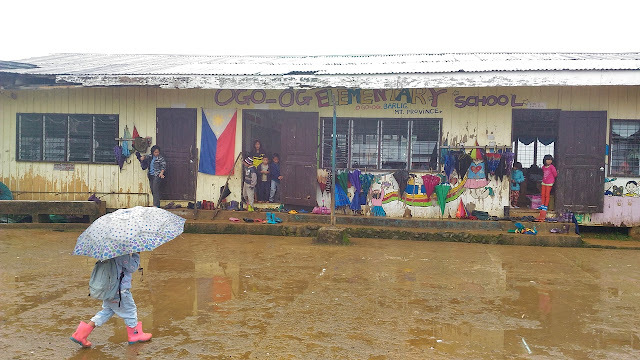 Since we missed meeting the students of Kaleo Elementary School, we just left the school-supply kits with the teachers to be distributed the next school day. 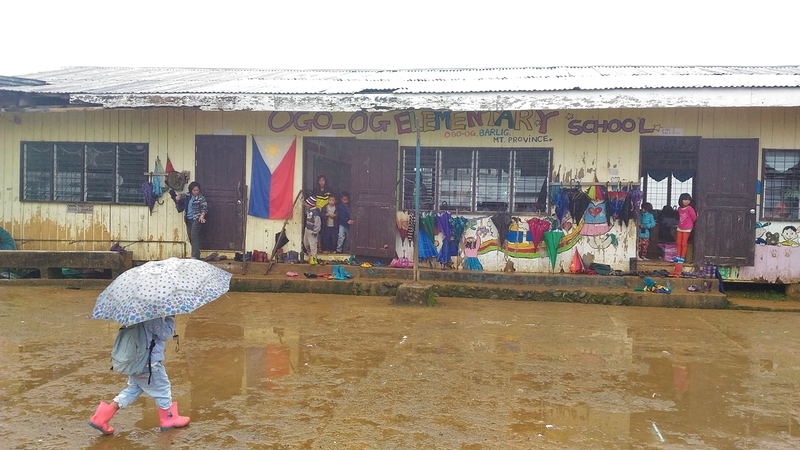 The next morning, though, we were able to visit Ogo-og Elementary School on a Saturday and chanced upon all the students who were attending make-up classes. The school of Ogo-og situates on top of a hill almost an hour away from Kaleo Elementary School. 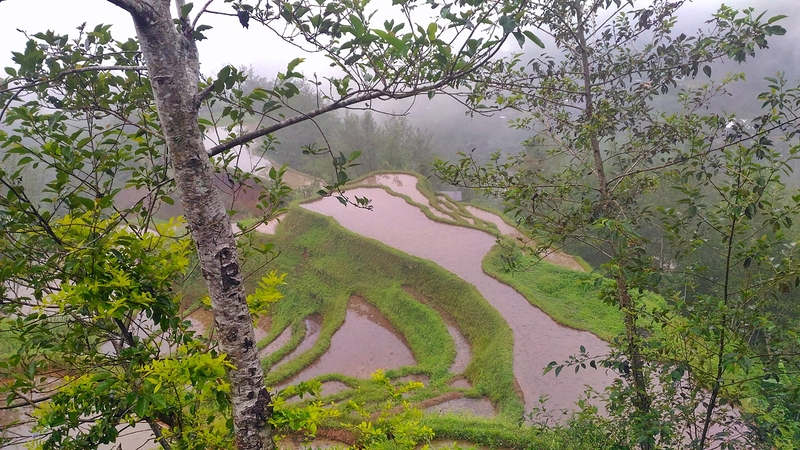 The trails in between dishes a picturesque set of rice terraces sights. As the greens of the mountains and the misty fog collided, a dreamlike scenery opened before us as we pass by a community far from almost anything but so near to all the beautiful things Mother Nature has to offer. We started giving away the school-supply kits as soon as the kids entered and filled the biggest classroom of the school with laughter and exhilaration. 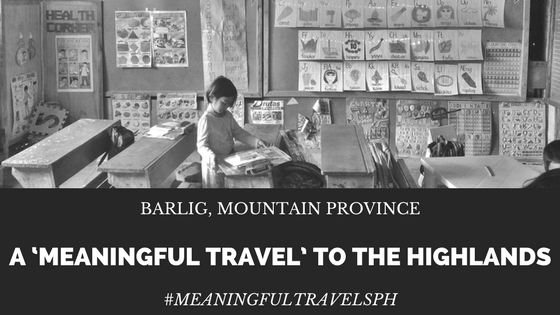 Throughout the whole morning, kindness once again took a life on its own, marking our long journey to Barlig, Mountain Province, one of my most meaningful trips ever.